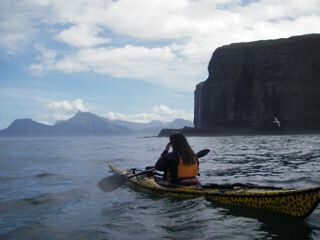 A stunning & challenging seakayaking journey to the dramatic Faroe Islands in Europe. Follow Justine Curgenven and paddling partner as their tent is flattened by gales, they cope with rough seas and fog & are taken in by locals. A stunning & challenging seakayaking journey to the dramatic Faroe Islands in Europe. Follow Justine Curgenven and paddling partner as their tent is flattened by gales, the rough seas and fog challenge them on the water, and the friendly locals invite them into their homes. On the sea, they paddle past fairytale scenery including the world’s tallest vertical cliff and thousands of sea birds. On land they experience hunting for puffins with long nets, eating raw meat & wonderful hospitality. Finalist at the Graz Mountain Film Festival & the San Francisco Ocean Film Festival.